Piping hot waffles are the star of the complimentary breakfast buffet at the newly opened La Quinta Inn & Suites Elk City where our guests also have free internet access local calls and private parking. 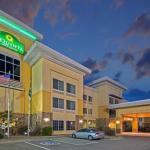 Built in 2012 the three-story La Quinta Inn & Suites shines. Decorated in neutral tones with bright splashes of color the 71 rooms and suites treat you to pillowtop beds covered with silky soft linens flat-panel TVs with premium cable channels and free wired and wireless internet access and local calls. Microwaves refrigerators and coffeemakers are among the homey touches. Well-lit desks with executive chairs are perfect for when you have to finish some last-minute paperwork. Bathrooms have hairdryers and massaging showerheads. Pets are allowed. Work out with the free weights and cardio machines in the mirror-walled fitness room or take a dip in the seasonal outdoor pool. A complimentary continental breakfast including freshly baked waffles is served every morning and free coffee is always available in the lobby. There's also a convenience store for all the things you might have left behind. A laundry room comes in handy for on-the-go travelers. Parking is complimentary. Located on Route 66 La Quinta Inn & Suites puts you within a few miles of downtown Elk City and the National Route 66 Museum. Local attractions like the Centennial Carousel at Ackley Park the Beutler Brothers Rodeo Arena and the Elk City are all within about three miles of the hotel. Nearby I-40 takes you to Oklahoma City or Tulsa. Will Rogers World Airport is 108 miles east and Lawton-Fort Sill Regional Airport is 110 miles southeast of the property.